Thomas Wright (1711–1786) had wide interests - ranging from astronomy, mathematics and navigation, to landscape gardening. He taught navigation as a young man and published books describing navigational instruments and mapping the heavens. His Original theory of the universe was published by subscription in 1750, and numerous aristocratic names are listed among the subscribers. The vision of the universe set out in this book is unique. Wright imagined – and sought to represent in his engravings – an infinite universe which contained the possibility of countless other “Peopled worlds”. His conviction that the universe was the work of a divine creator is evident in several engravings which use the motif of a disembodied eye to represent the creator’s omniscience. Wright’s Theorymay seem whimsical or eccentric and it does not seem to have influenced subsequent mainstream astronomy. Nonetheless, there are elements of truth in his conception of the Milky Way as a disc of irregularly distributed stars, which anticipated the hypotheses of influential astronomers such as William Herschel. 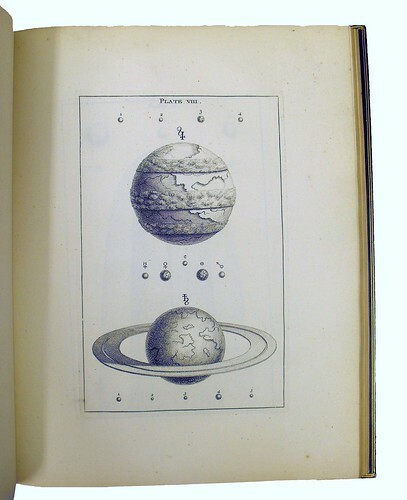 Image: engraved plate, 'a proportional Drawing of all the primary and secondary Planets together, distinguished by their Characters...'.